Born in Amdo, North-Eastern Tibet, and educated in a Bonpo Monastery, Samten G. Karmay studied Buddhist philosophy at Drepung, a monastic university in Central Tibet, till 1959. He was also Visiting Scholar at the Scholar at the School of Oriental and African Studies, University of London where he had obtained M. Phi. And Ph. D. Degree. He has been visiting Scholar in a number of academic institutions; Ecole Pratique des Hautes Etudes, Paris; Toyo Bunko, University of Tokyo and the University of Kyoto, Japan. In 1981, he became charge de Recherche in the centre national de la recherché scientifique (C.N.R.S), Paris and a member of Laboratoire d’ethnologie et de sociologie comparative, comparative, universitie de Paris-X. From 1989, he became a directeur de Recherche in C.N.R.S. and was awarded the 1990 Silver Medal of the C.N.R.S for “I’ originalitie et la qualite” in his research. He has carried out several research missions in Tibet: amdo in 1985, Central Tibet in 1987 and 1991; Khams and Amdo in 1993; central Tibet in 1995; Indian and Nepal in 1996. In 1995 he was elected President of the International Association for Tibet Studies at its 7th congress in Graz Austria. He is the author of several books including The Great perfection, A Philosophical and Meditative Teaching of Buddhism, and Secret Visions of the Fifth Dalai Lama. 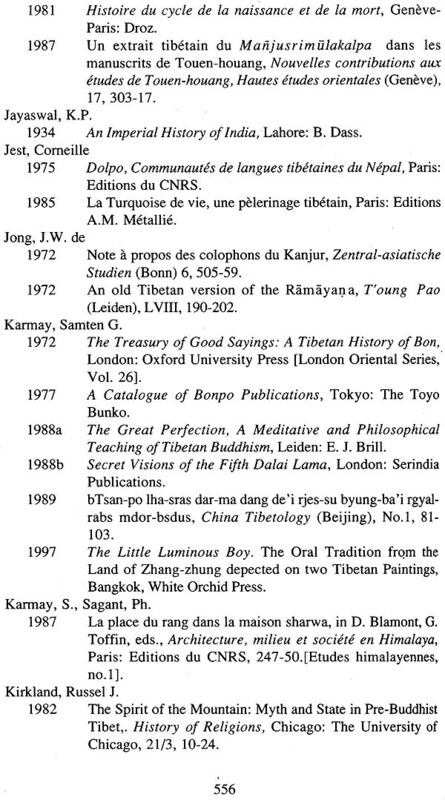 He has also published over forty articles on various aspects of Tibetan civilization in English, French and Tibetan. This volume contains articles that were written over a period covering the space of 2 decades. They deal with diverse subjects', but are related to one another insofar as they focus on Tibetan culture. The first part of the volume is devoted to historical documents. Articles Nos.1 and 2, examine materials that have never been published before partly because they lay undercover in a large work in two volumes so that their existence could not easily be spotted unless one was working through the volumes. They shed light on the social and religious problems caused by certain types of Buddhist practices that were current during the period from the mid-ninth to the mid-eleventh centuries in Tibet. In addition to these, while one official document (No.3) highlights political and religious activities of a kingdom far from Central Tibet, another official rock-carved inscription (No.4) brings a new dimension to the historical study of the Tibetan empire. 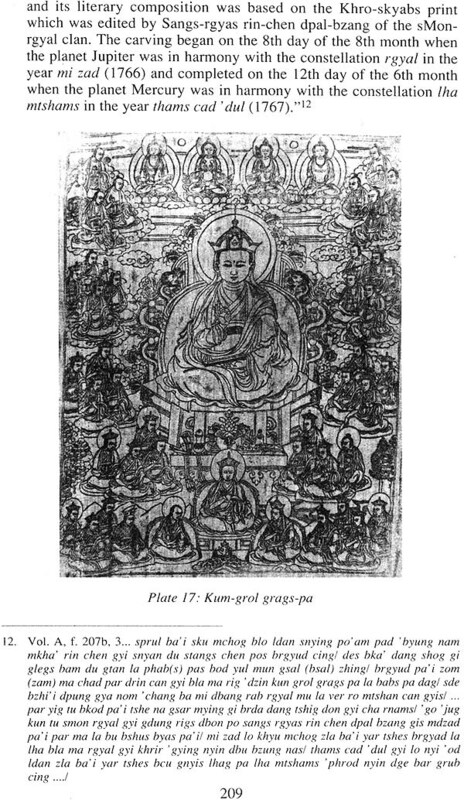 The second part consists of studies in Dzogchen philosophy, drawing mainly on its oldest text found among the Dunhuang manuscripts (No.7). 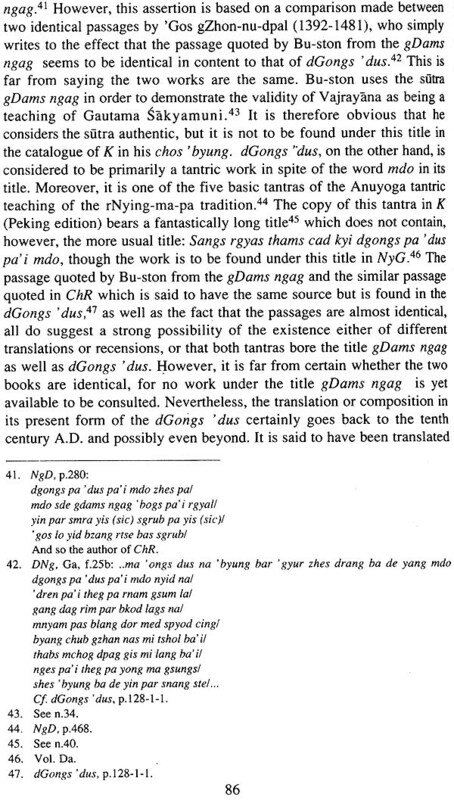 Does this have an Indic origin as the Nyingmapa school claims? 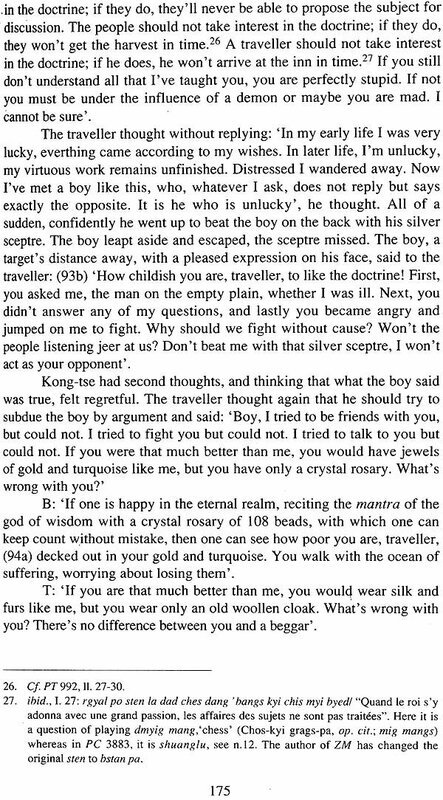 This leads on to observations (No.5) on the polemics that raged through the centuries concerning the origin of Dzogchen philosophy. It is followed by a study using early documents concerning the origin myths of tantric doctrines (No.6). From an early period tantric teachings in Tibet became a subject of controversy. Doubts were expressed concerning whether tantric doctrines should be considered as genuine Buddhist teachings. 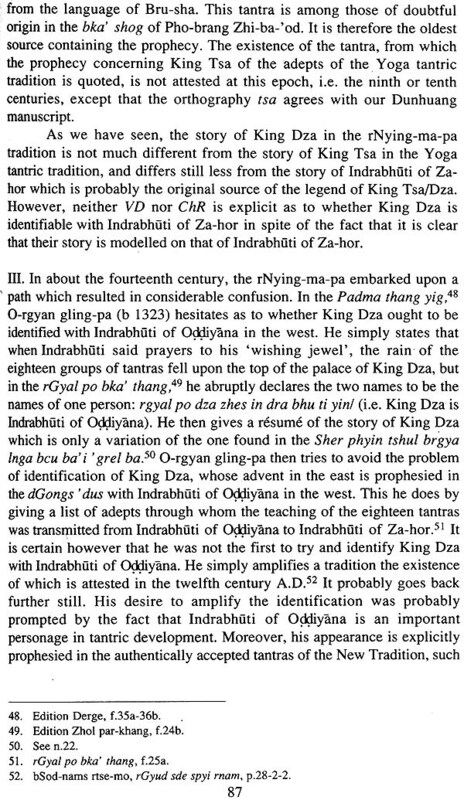 The object of this study is therefore to display the kind of historical and doctrinal problems that the Tibetan Buddhists endeavoured in various ways to solve. The third part brings up the topic of the Bon religion. Article No.8 corresponds to lectures that were given in the Toyo Bunko, Tokyo. They are mainly concerned with general historical and religious problems of the Bon tradition and its relation to Tibetan Buddhism. 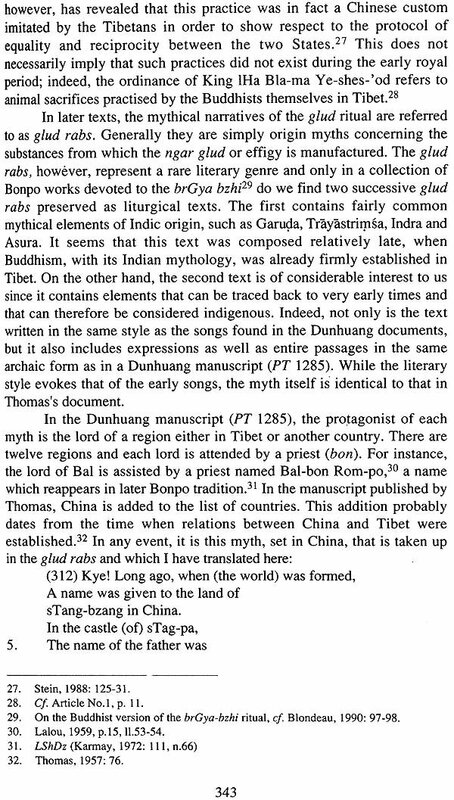 The Bon tradition presents itself as a pre-Buddhist religion in Tibet and is also regarded as such by the Tibetan Buddhist historians. Different views on this are, however, held by some Western scholars. According to some it did not even exist as a religion before the eleventh century and according to others the term bon merely signified rituals or denoted a group of practitioners before the tenth century. If these views are to be accepted, how are we going to interpret such early documents as the one that we propose to study (No.9)? Related to this topic was the burning question of whether the life-stories of the Bon master retold in lengthy writings were forged on the model of the Nyingmapa literature. 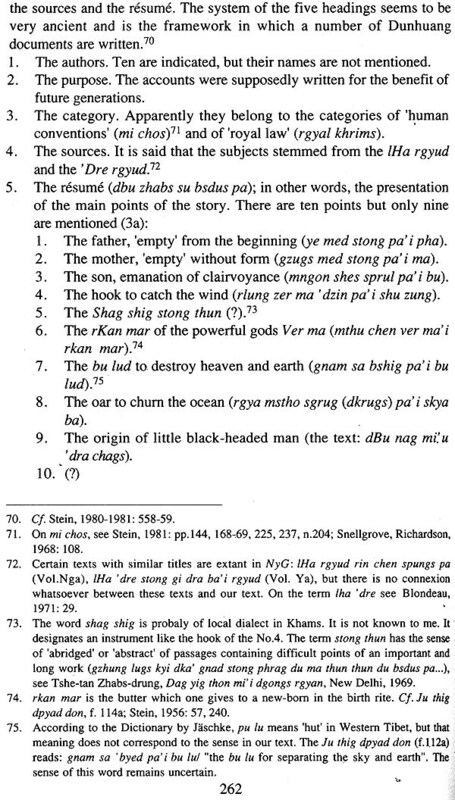 In order to explore the kind of inspiration and materials that were used in writing such life-stories, article No.10 makes analytic comparisons between the native writings and an ancient Chinese story of Central Asian origin. The Bon tradition presents a rich indigenous culture. The sacred dances that it preserves are of particular interest. Article No.11 draws attention to this aspect of the tradition. We also encounter literature on the organisation of domestic space (No.I2). 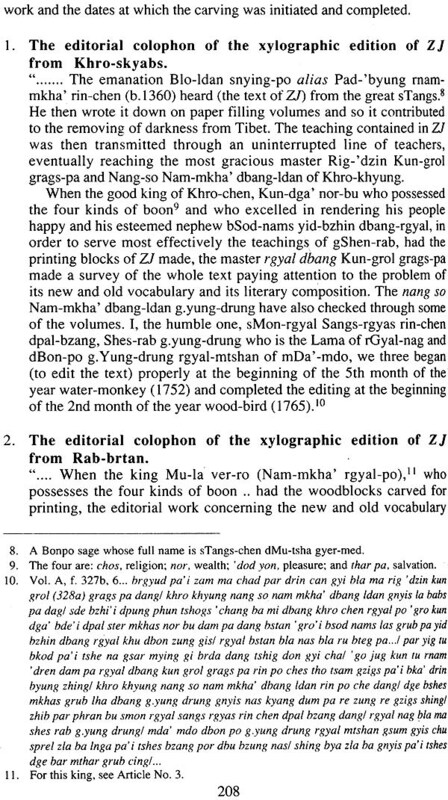 One of the strongholds of the Bon tradition was Gyalrong, where wood-blocks for the impression of a large part of the Bonpo Canon were made. Article No.13 looks into the working organisation of the wood-blocks. The historical tradition of Bon is closely connected with the region of Kongpo where its chief sacred mountain is to be found. Article No.14 illustrates the subject of the mountain and its surroundings with ethnographic data as well as with literary sources. This part of the book then closes with an analysis of a polemical text (No. 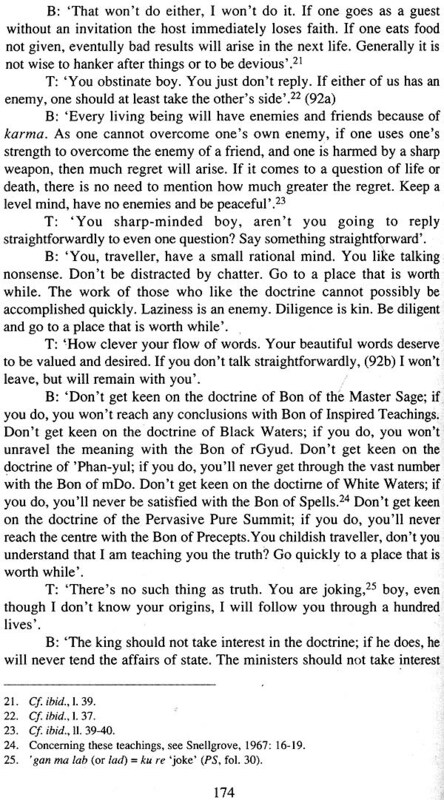 15) concerning the origin of the celebrated four-fold medical treatises and the ensuing controversy between the Medical schools themselves as well as between the Bonpo and Buddhist traditions. The third part of the volume takes up the subject of the relation between myths and rituals, and the religious beliefs that myths and rituals engender. Popular rituals and the beliefs they communicate in Tibet are mostly related to the origin myth of the first Tibetan king, the mythical founder of the Tibetan nation. 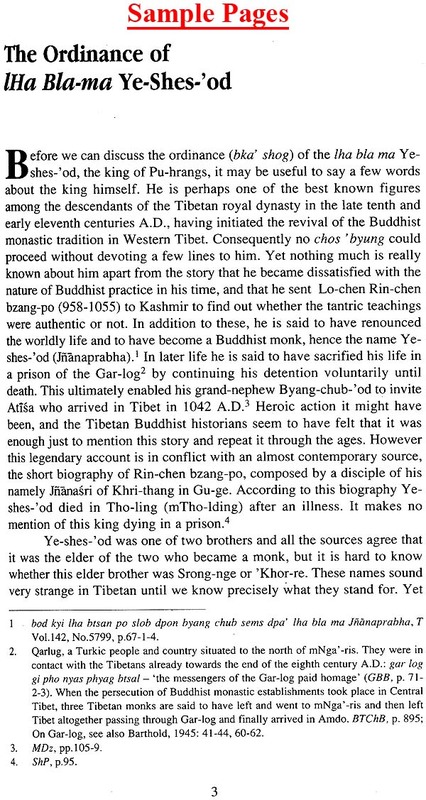 Article No.16 takes a close look at the presentation of the origin myth of the Yarlung dynasty. 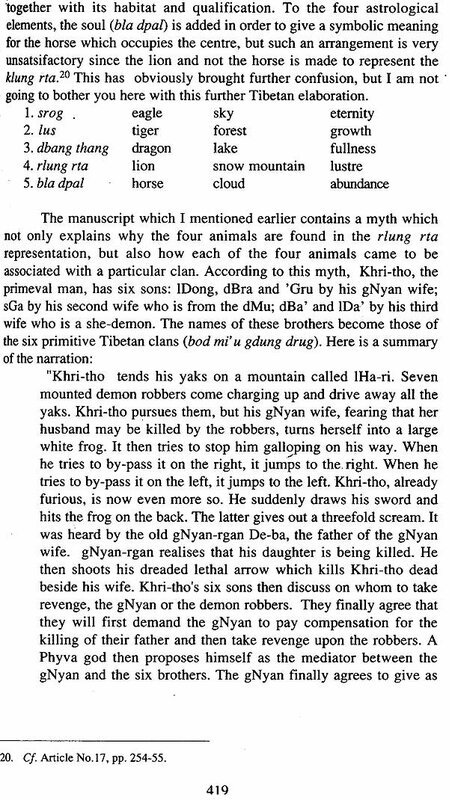 This is followed by a study of the myths concerning procreation and creation of the Tibetan people as a particular race (No.17) based on an unknown manuscript. Rituals are often studied as an entity on their own by philologists. They are often thought of as being devoid of any religious concepts, or detached from their social context. But this gives the researcher little chance of grasping the inner workings of the rituals. It is therefore essential to carry out fieldwork for an understanding of the depth of the ritual significance. This leads to another article, No.18, that analyses various versions of the origin myth of the first Tibetan king using a hitherto unknown early source. That text enables us to reconstruct in its complete form a myth that is otherwise found only in its different parts scattered in various documents. With this in mind, article No.19 considers the notion of 'soul' and its function in various rituals, taking into account the social context of a given society. The notion of ritual ransom is an undercurrent in many of the Buddhist and Bon popular rituals, but it presented itself at its clearest in an annual state ceremony in Lhasa in the pre-communist era of Tibet. Article No.20 focuses on this state ceremony of the old Tibetan government in which human ransoms play a predominant part, as well as bringing into the light the origin of the ceremony itself. The popular ritual of the burning of juniper leaves and other aromatic shrubs as offerings in various social contexts is a visible feature of Tibetan culture. The study (No.21) of this ritual reveals that it was in fact a purificatory ritual in its origin, and also discusses the stages through which it evolved from its indigenous concept to its transformation into a lamaistic ritual. This study is followed by an investigation (No.22) of the ritual of the well-being of man. 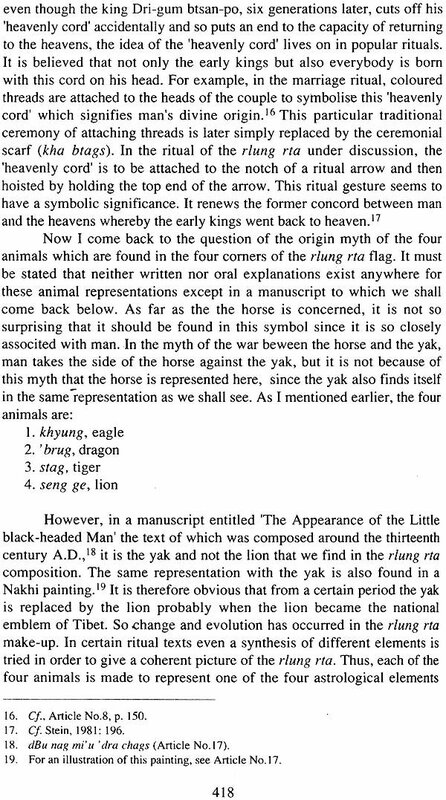 It is in 'fact a part of the previous ritual (No.21), but its mythological function and symbolism have been misunderstood. 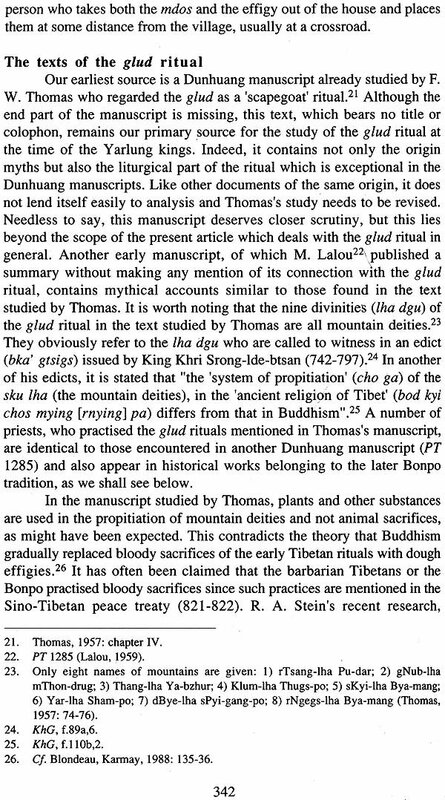 Closely linked with this ritual is the mountain cult (No,23) which plays an essential role in the construction of ethnic identity, but has never been given prominence before in writings on Tibetan culture, partly because it is mainly the affair of laymen. In other words, it did not form part of the Buddhist culture and therefore remained unnoticed. The central notion of this ritual is the deity of the local territory, a notion that has an important bearing on political organisation in Tibetan societies. In order to assess the social and political dimensions of the ritual, my study (No.24) combines an anthropological and philological approach and draws on a certain number of oppositions: practices in the past and those of the present day, kings and local chiefs, central state and local government, lay tradition and monastic establishment, regional and local, oral and written traditions, national myths and local folk-lore, imported foreign gods and local native spirits. By contrast with the notion of the deity of local territory, the sanctification of a mountain as a holy place for spiritual exercises involves a totally different procedure. Few have so far realised the difference between the two notions. Article No. 25 elucidates the process in which a mountain is designated as a holy place. 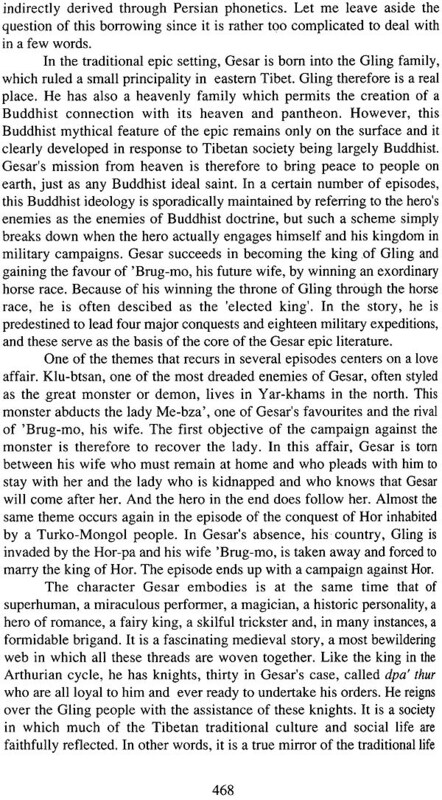 The fifth part of this collection deals with the Gesar epic. 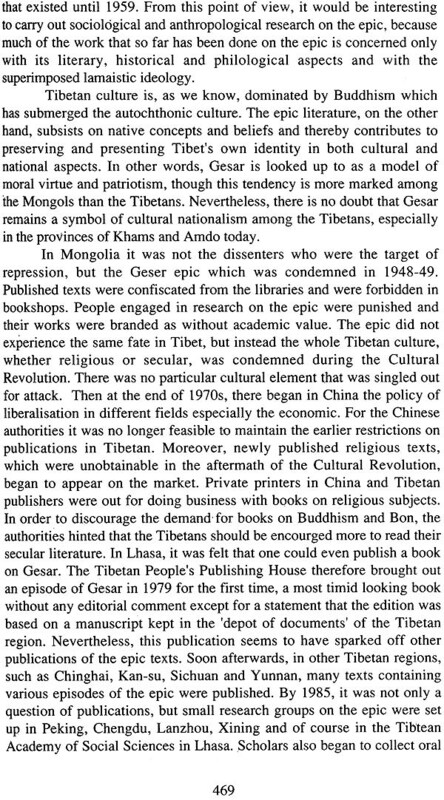 Article No.26 is concerned with an outline of the epic literature together with an assessment of its influence on the present day Tibetan people under the conditions of foreign occupation. 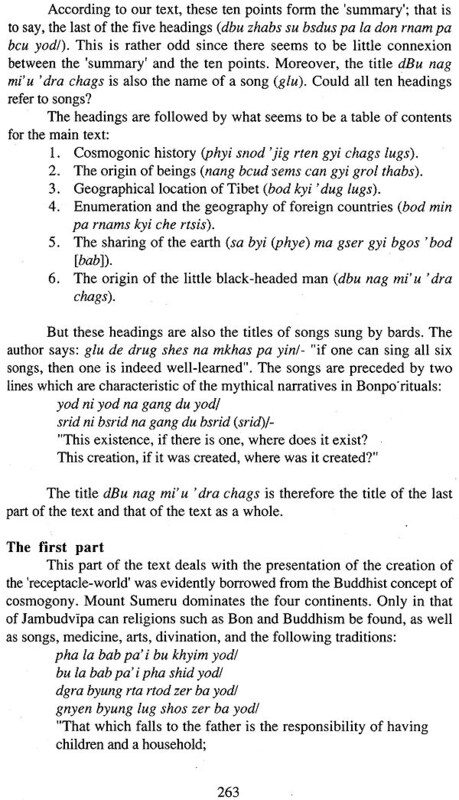 The Tibetan epic literature was intensively studied by European scholars mostly focusing on the kinds of material that make up the epic. However, their work lacks a basic structural presentation, The present article No. 27 endeavours to fill in this gap. Furthermore, research on the epic has so far been carried out on the basis of a purely philological orientation. The idealised society and social life depicted in the epic have not been compared with real life in the field. This needed to be examined through an anthropological lens. 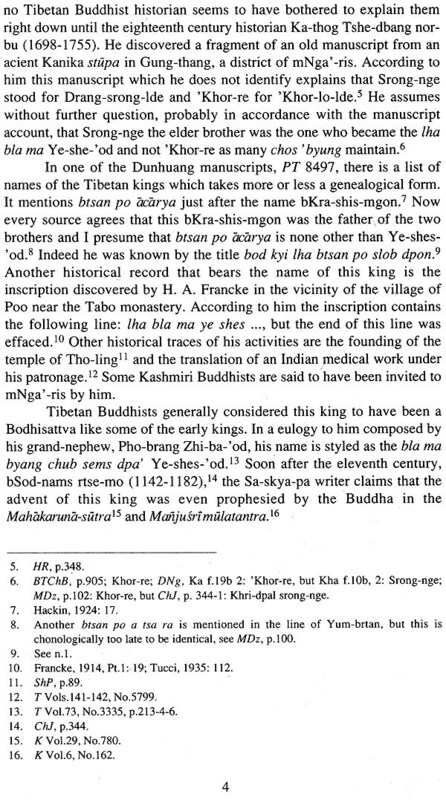 To perform this task, my research (No.28) tries to discover the basic pattern in the social organisation of the Tibetan epic. The sixth part mainly looks at the political decline of Tibet. 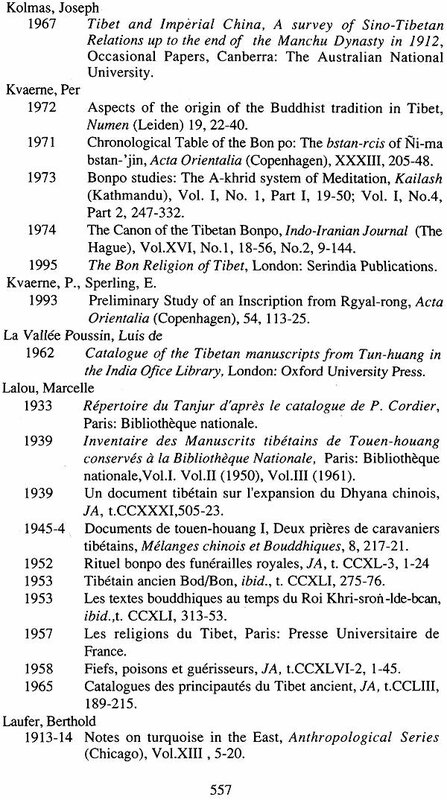 Article No.29 considers first the regaining of Tibetan unity in the seventeenth century with the accession of the Fifth Dalai Lama as the sovereign of Tibet. This is followed by an account of his state visit to the Manchu emperor in Beijing (No.30). Government by ecclesiastics and aristocracy had never been beneficial to the Tibetan people. It constituted the real obstacle to the modernisation of Tibet and was of course the main cause of the backwardness that undoubtedly paved the way for foreign occupation of the country. Religious sectarianism and regional faction is still a prominent feature of the Tibetans in exile. Article No.31 contemplates this problem. The volume closes with an historical outline of Amdo, the traditional province of north-eastern Tibet (No.32). The province is presently engulfed by Chinese settlers and is divided up among the Chinese provinces. Consequently it now exists only as a name.